← I get email: How could everything be packed into an infinitesmal universe? 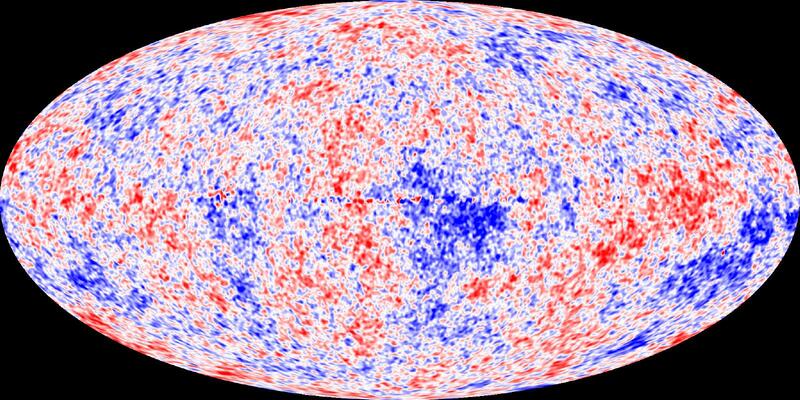 The shape of the universe is depicted as a stretched circle. Where are we located in relation to the overall geometry? The asker (someone named George) is trying to wrap his head around how we project ourselves into different versions of maps of the universe. And this is a very tough question. The universe, after all, is (at least) three-dimensional and your screen is at most, two-dimensional. What’s more, the observable universe spans a dynamic range of billions, from the distance to the nearest star (about a parsec), to the horizon scale of the universe (about 14 Billion parsecs), which means that fitting everything on a single slice is kind of complicated. Every dot in this map is a galaxy. The clean, empty regions to the left and right are just areas where the survey didn’t probe. In this map, we’re at the center, so you get a quick visual of how far away galaxies are from us and from each other. The only problem is that in order to make sense of it all, we can only look at a thin slice of the universe in any given map. You’ll want to click on the map to enbiggen (or better yet, to buy Rich’s excellent book in which he has a full-color pull out), but the basic idea is this: the surface of the earth — the equator, really — is near the bottom of the map (and the interiors of the earth below us). Any point above the surface on the map shows essentially what a person on the equator could see if they looked up and had amazing vision. In order to fit everything on, Rich stretched it so that equal distances on the map correspond to equal ratios of physical distance. For instance, Proxima Centauri (the nearest star beside our own) is about 270,000 times further than the sun. As it happens, the galaxy, NGC 6822 is roughly 270,000 times further than that a distance of about 340,000 pc from the earth. The vertical distances between the sun and Proxima Centauri, and between Proxima Centauri and NGC 6822 are drawn the same. 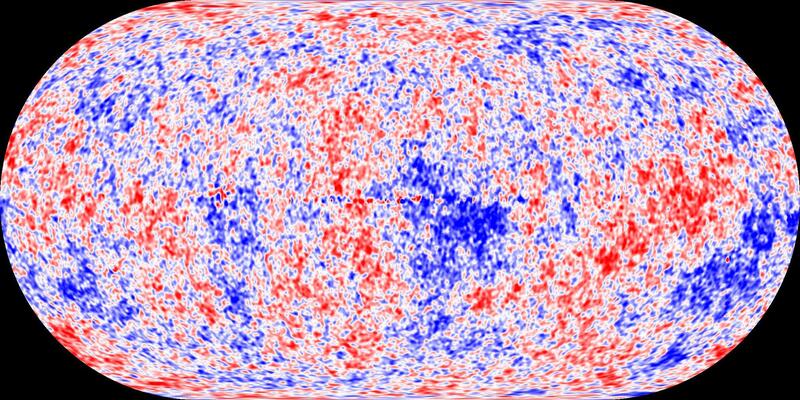 Blue spots represent “cool” regions of the sky, while red spots represent “hot” spots, where in this case, cool and hot correspond to the minutest differences of only about 1 part in 100,000. Of course, a globe looks cool, but in many ways isn’t practical. We can only look at half the sky at once, for instance. Moreover, a picture of a globe produces distortions in what we see. Instead, we make an all-sky map. Again, this is identical to the problem of making an all-earth map except that we are seeing it from the inside rather than the outside. As with the earth, every latitude and longitude just corresponds to a particular point on a sheet of paper. The projection you choose tells you how to make those choices. The Mollweide has a number of nice properties. It has relatively little distortion, and (most importantly for all-sky maps), is area-preserving. In other words, hot spots that look the same size on the map really are the same area on the sky. This is also area-preserving, but has the additional nice property of having smaller shape distortions and smaller distance errors. In other words, points that appear close to one another in the Eckert IV really are close to one another. In a paper in Cartographica, Rich Gott and I argue that this is the best area-preserving map. For my money, it should be used for all CMB or other full-sky maps. So a rather long-winded answer to what seemed to be a simple question. But on the other hand, it gave me an opportunity to draw a bunch of maps. p.s. If you haven’t already done so, be sure to become a fan of my new facebook page! This entry was posted in Uncategorized and tagged astronomy, email, maps. Bookmark the permalink. 2 Responses to I get mail: Why are maps of the universe drawn as ellipses? It is kind of amazing, and I strongly urge you to check it out. Where can I get just a nice print out of that logarithmic projection.